“Just wanted to say how pleased we are with our new surface. The kids are beside themselves with joy at being able to facilitate a game of soccer, run around the track and have access to space all year round! It has created a real buzz of activity around the school. The addition of this outdoor surface adds to our complete package of being a school that takes pride in its environment. 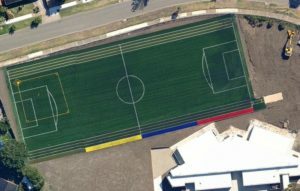 The professionalism and communication during the process was outstanding and we have certainly had many, many comments on the appearance of the surface.